On June 24, some 250 socialists, overwhelmingly young, gathered in the offices of the nurses’ union in Oakland CA. They gathered to elect new officers and delegates from the East Bay chapter of Democratic Socialists of America (DSA). 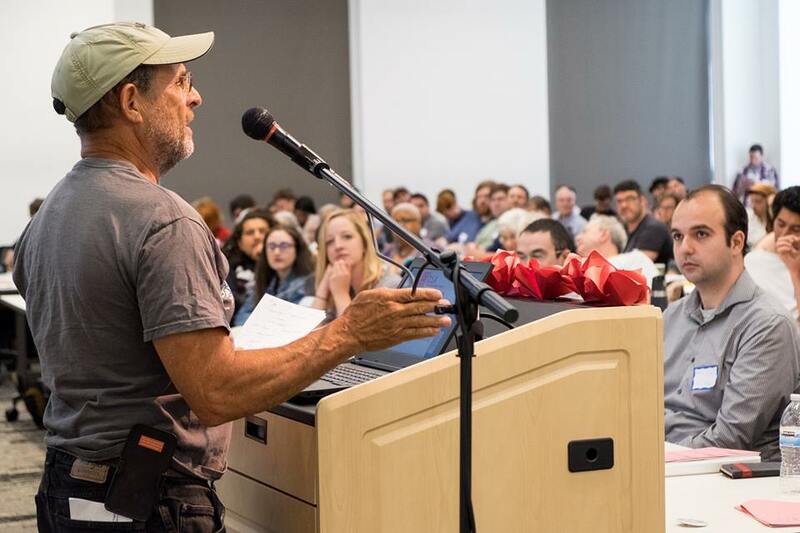 From a group that claimed about 6,000 members just one year ago, and from meetings of about 30 in this area, DSA has mushroomed to over 20,000 members nationally, and a turnout of over 100 at meetings in the East Bay is routine. Clearly, something is happening, DSA is being transformed as thousands of mainly young former Sanders supporters, turned on to struggle and to socialism, are swelling the ranks of DSA. 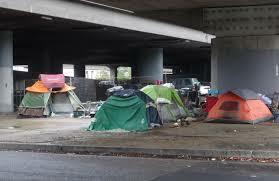 One of Oakland’s many, many tent cities. Working class people are being driven out of Oakland. If this continues, Oakland will lose its working class base. Appalachia to the college graduates working low wage wait-person’s and barista jobs in Oakland (where average rent for a one bedroom apartment is $2,424/month while median income is $4,413/month, making rent unaffordable for over half the population). This transformation, however, also means that the program and policies of DSA should be reevaluated. Socialist Planning or “Market Mechanisms”? Presently, DSA calls for a brand of socialism based on “democratic planning and market mechanisms.” What, though, does this mean? Does it mean something like what they have in Sweden and other Western European countries? If so, people should be aware that in every single one of these countries the social benefits are being reduced. In Britain, for example, one publicly owned industry after another has been privatized and even the National Health Service (socialized medicine) is under attack. The fact is that we can no more mix a planned economy with “market mechanisms” than we can mix two different and competing lion prides. Something has to give, and surely the last ten years have proven the disaster of these “market mechanisms”! It is understandable how somebody might have had illusions in these “market mechanisms” 25 years ago, but today they have been exposed for what they are: A disaster for the human species and, in fact, for all life on this planet. He was clear on the two parties of capital, the Republicans and Democrats. Today, just as many large capitalists are in the Democratic Party as in the Republican. 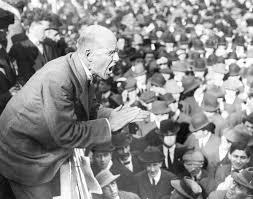 Eugene Debs, who is frequently quoted in DSA, expressed the matter perfectly: “The Republican and Democratic Parties, or to be more exact, the Republican-Democratic party, represent the capitalist class in the class struggle. They are the political wings of the capitalist system and such differences as arise between them relate to spoils and not to principles.” For Debs, the idea of supporting any Democrat was anathema. Debs lived in the days of a most brutal and clear-cut class struggle. In the ‘80s and ’90s it may have been a little more difficult to see that struggle and, therefore, a little more difficult for some to clearly see the role of the Democratic Party. Maybe at least in part for this reason, DSA developed a pattern of supporting various Democrats, even mainstream ones like Walter Mondale and John Kerry. It also supported Jesse Jackson when he ran for president. Jackson has since been largely discredited. 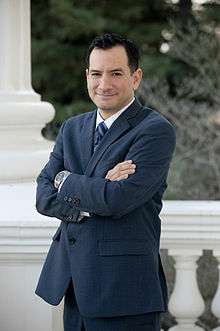 California Assemblyman and Speaker of the House, Anthony Rendon. He was unanimously elected Speaker, including with the support of the Republicans. Since he shelved the “single payer” health care bill not a single Assembly member has called for his removal. They are all in this together. whole (and unanimously)! And since his having killed the bill, there has not been a single call to remove him. If the individual Democrats didn’t breathe a sigh of relief when the bill was killed (meaning they wouldn’t have to vote on it), it was because this was planned this way all along. It’s a reminder of what happened when then President Bill Clinton was pushing NAFTA through the US Senate. At that time, it came out that a couple of Senators had let Clinton know that they were going to vote against NAFTA… unless their votes would make the difference between that treaty’s passing or not. In that case, they’d vote for it! Linking our fortunes to the liberal wing of the Democratic Party is, at best, like chasing the end of a rainbow. It’s always just one more step down the road. And the further we go, the more it recedes… while it remains tantalizingly close. In the past, some said that they were pursuing an “inside-outside” approach to the Democratic Party. This meant working both inside and outside that party. Inevitably, this means being drawn into the Democratic Party and following behind the agenda of the more liberal wing of that party. It’s just like the relationship between a small and a large body in space; the small body will be drawn towards the larger body and revolve around it, not the other way round. From New York to California, a wing of the union leadership is playing a prominent role in DSA. The situation inside the unions is relevant for DSA. There hardly has been a time when more members feel more alienated from their unions, so much so that many don’t even know the name of their union. Time and again, members will tell stories of feeling let down by their leadership when they – the members – have come into conflict with their supervisors at work. It’s the same as far as opposing concessions and fighting for strong contracts. What these members are seeing is the “team concept” in action, the view that the unionized employers and the union are on the same team. Politically, the union leadership has latched onto the Democratic Party like a drowning person latches onto a passing piece of wood. The Albany Bulb tent city. The Sierra Club supported their eviction. Then there is the role of the non-profits, particularly the environmental groups like the Sierra Club. These groups, too, are closely tied in to the Democratic Party, partly through Democratic-linked funders like the McKay Foundation, and their policies reflect that. (See this article for more details.) 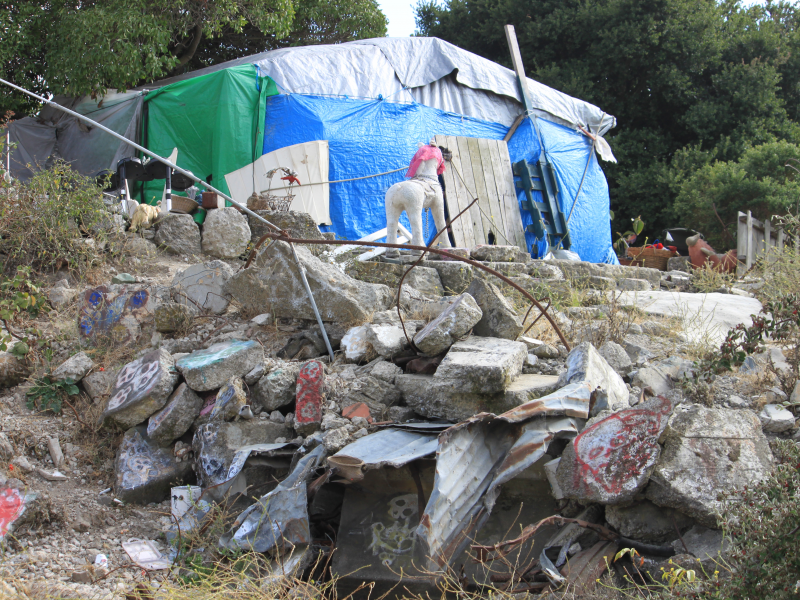 A perfect example occurred in 2014 when the long-established homeless encampment at the Albany Bulb was evicted by Albany’s corporate politicians. Some of those living there had been there for over 20 years. Disgracefully, the Sierra Club supported this mass eviction. At the recent East Bay DSA meeting, the issue of a possible dues increase was raised for discussion. Many members felt that (1) it should first be determined how the money was going to be used, and (2) that some of the money should go to the local chapters. Of course, smaller and more isolated chapters should get the support from the larger ones, possibly through the national leadership, but the idea of local chapters having their own treasury is valid. Just as in the unions, where the rank and file membership should be able to elect their own full time officials – rather than those officials being appointed by the national office – the same hods true for DSA. In that way, a DSA chapter could more effectively implement its own priorities, especially if they are not exactly the same as those of the national leadership. This is clearly true for the East Bay DSA, where members should have some organized, structured means of exchanging views and setting priorities – some sort of regular, monthly meetings in other words. Take the situation here in Oakland, for example: We are witnessing a gentrification like nothing Oakland has ever seen. Rents are shooting sky-high, driving tens of thousands of working class people – especially black working class people – out of the city. 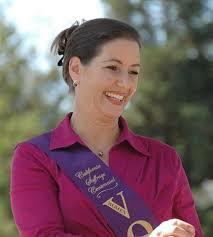 Together with other liberal Democrats, she is leading the gentrification of Oakland. Oakland’s mayor is helping this process along. In the summer of 2016, for example, she never even applied for federal funds for a summer youth job program. Why make it any easier for black and Latino families to stay, is her position. The police, too, are collaborating, harassing black and Latino drivers, etc. If this continues, Oakland will lose much of its working class base – exactly the base that any socialist movement must depend on to grow and thrive. A review of the donations to the city council and mayor’s campaign funds reveals that the major donors are real estate developers and banksters. They are the ones who run the city of Oakland! And those who don’t rely in the main on such corporate funding are cozy with those who do. There is absolutely no reason that DSA should not run its own candidates as socialist representatives of the working class for Oakland city council, Board of Education, etc. If it could put over 100 canvassers out on the streets to campaign for single payer (not even for socialized medicine! ), it could actually get some of its members elected to office. But here’s the catch: They would have to run explicitly opposed to the Democratic Party machine that dominates Oakland politics. They would have to be clear that their campaign is part and parcel of a campaign to build an alternative to the Democrats, a mass working class political party with socialist politics. Otherwise, they would get sucked into the liberal Democratic Party machine. The influx of many thousands of youth who are looking for a road to socialism comes from a transformation in US society. But it also means that DSA itself has been transformed. This transformation should be reflected in the politics and the structures of DSA. The support for the liberal Democrats, and willingness to allow them to set the political agenda is inappropriate. Among other things, it prevents DSA from playing a leading role in advocating for and in building the alternative to this party of capital, in building a mass, working class party with socialist principles. In larger chapters, such as the East Bay chapter, there is no reason in the world why DSA cannot run its own independent, working class and socialist candidates for local office as a means of making clear and explicit the need for a mass working class political party. The structure of DSA should reflect the influx at the base. This means increased finances and power at the branch level, and regular meetings of the membership where they can plug in, discuss their experiences and play an active, systematic role in determining the priorities and approach of their branches. The fact that millions of working class people – mainly but far from entirely white males – voted for Trump shows the crisis that exists within the working class. A huge change is inevitable – either forward or backwards, to even greater reaction. The essence of the crisis in the working class is defined by the absence of a fighting, mass working class party – a party that explains the issues in terms of workers vs. the owners of capital, the capitalist class, that helps workers draw lessons from the experiences, that mobilizes the class and that contests elections against the two parties of big business, the Republicans and Democrats. The huge surge in growth of DSA shows the enormous potential for the rise of such a party. DSA can play an important role in the creation of this party, if it shifts gears from that of the past to the present situation. The author of this article speaking before the June 24 meeting of East Bay DSA, calling for an end to support for Democrats, running working class socialist candidates for local office and for regular chapter meetings. These are a series of things DSA should avoid, unless its goal is to wind up as yet another Trotskyist sect. Not a single new idea here. How is DSA running its own candidates for office in Oakland going to lead it to becoming “yet another Trotskyist sect”? How is empowering the rank and file by having regular branch meetings and developing a branch treasury going to do make it a small “Trotskyist” sect? Where has DSA supported liberal Dems recently? Honest question, it’s a large organization. Has East Bay DSA done this? Valid question, Ryan. I don’t know if they have or not recently, but there’s also the other aspect: If you (speaking in general, not referring to any individual) don’t have a clear alternative, you will inevitably tend to get pushed into supporting the Democrats. The whole way that single payer is being handled is an example. It’s being shelved is blamed on one individual, the Speaker of the House. The logical inference is that the Speaker has to be changed. But there seems to be a reluctance to acknowledge that the Speaker was basically saving his party as a whole and that he represents his party as a whole. The logic of this tends to be to get involved in the Democratic Party to push it to the left.